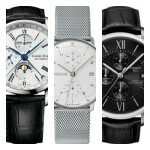 What do you consider before buying a watch? As for me, I consider the value and quality of the watch. You don’t want to spend a lot of money for a new timepiece, and at the same time, I doubt if you will want to overspend on something that might end up being a piece of junk. Tissot watches can provide you with both quality and value at the same time. Founded in 1853, Tissot is a watch manufacturing company that pride itself for building superior mid-range watches brands from Switzerland. Originally the company was started as a comptoird’etablissage, meaning that different parts of a timepiece were made at home by an independent network of workers. The timepieces are then brought together so that the timepieces can be sold. Way back in 1999, the Swiss watchmaker made the world’s first tactile watch, the T-Touch. This timepiece contained sapphire crystals that housed the touch-sensitive technology. The technology allowed the user to control certain features such as the thermometer, altimeter, compass, and barometer. 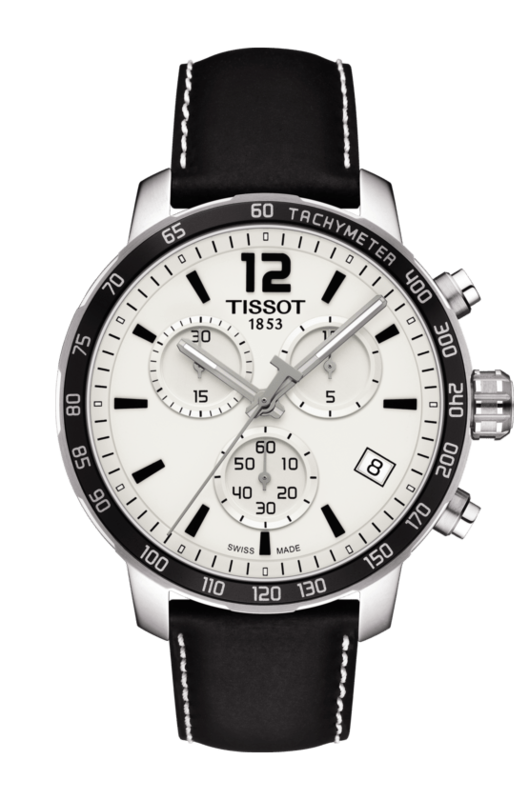 With Tissot, you will always find a combination of both high-quality luxury watches and fashion watches. From the various categories offered you can choose a great model that will perfectly fit personal style. 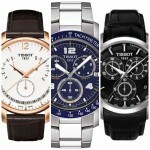 Now let’s dive in and focus on the best leather strap Tissot watches for men that offer great value for your money. This timepiece is an infusion of design and craftsmanship that goes into every Tissot watches. Tissot Couturier watch blends materials and elegant lines to match. This watch is ideal for sports lovers because of the chronograph and a special tachymeter. The watch has a perfect white dial with a stunning brown leather strap. The watch features a 41mm diameter and a thickness of 11 mm giving a perfect fit on the wrist. Its water-resistant capacity is 330 feet. All the features of this watch complement each other making it a superior- classy watch. 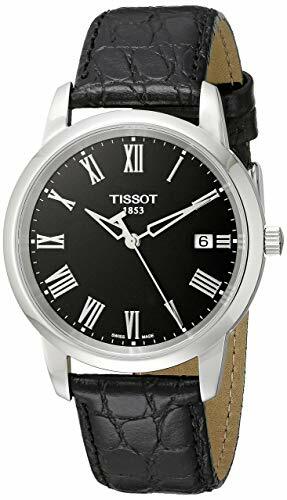 Tissot Men’s analog quartz watch is a very simple and an elegant Swiss made watch. It features quartz ETA movements, scratch resistant sapphire crystals, and a stainless-steel case. Fused with coordinating black leather straps which bring a sense of satisfaction to the owner. It is completed by Roman numbers dial type. 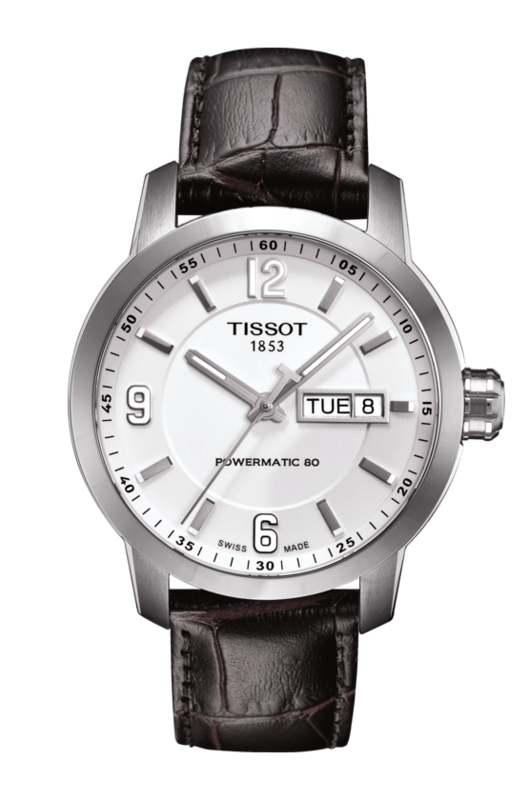 If you are after simplicity and sophistication then Tissot automatic watch is made specifically for you. This watch offers you quality and perfection that is engraved in every Tissot timepieces. It has a case diameter of 40 mm and case thickness of 10mm. The deployable buckle provides a perfect fit for anyone with a small, medium and large wrist. The perfect combination of the brown leather strap and the silver colour gives the watch a good-looking appearance. Do you want a timepiece that will complement your casual look? Tissot quartz watch is the best choice for you then. It has a weight of 64g making it so light that you won’t notice that you are wearing it. The white dial with rose gold-tone and index markers depicts the outstanding beauty of the timepiece. They have made it in a way it can resist water up to 300 meters. Fusing it with a brown leather strap keeps it simple yet smart. 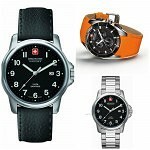 It is an attractive watch that will offer great value for money. 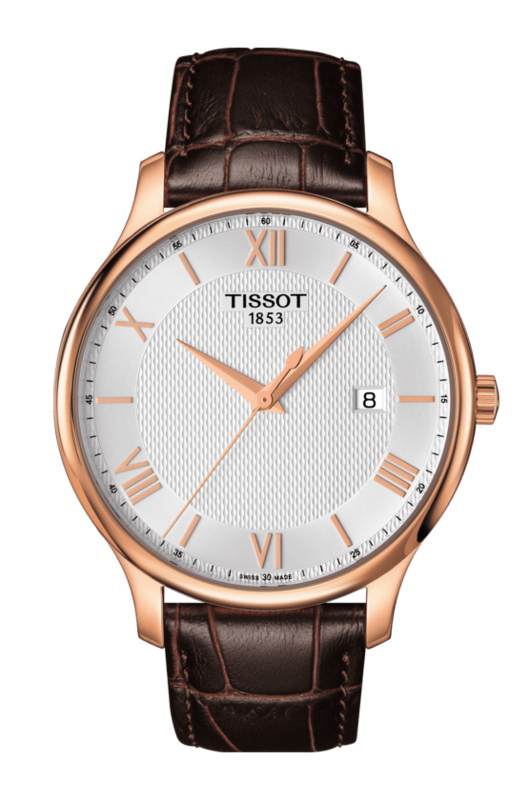 Powered by quartz movement, Tissot traditional watch is made from PVD rose plating. You can confidently rock this watch on formal occasions and work. The craftsmanship of the Red Gold case is undeniably perfect, corresponding with stainless steel. The watch is very comfortable when being worn and it’s exceptionally secure. This is due to the presence of a deployment buckle that is featured on the brown leather strap. 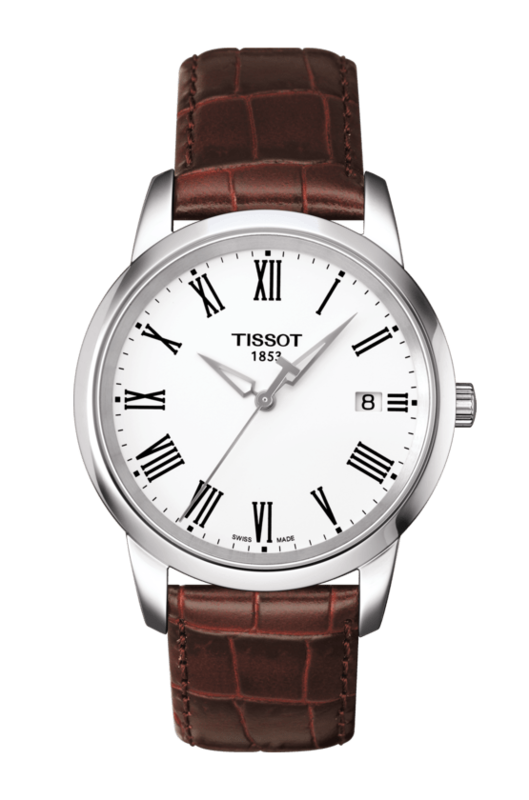 Here is another Tissot watch that is completely elegant and can match with any wardrobe attire. Classic Dream features a round white dial with black Roman numerical indices and a date window giving it a vintage look. It has a 38mm stainless steel case with synthetic sapphire dial window which keeps the watch pristine from scratches. The watch delivers quartz movement with analogue display. The croc-embossed leather band with buckle closure delivers a classy look. When it comes to water resistance, it can generally withstand splashes and brief immersions. So, it is not suitable for swimming. 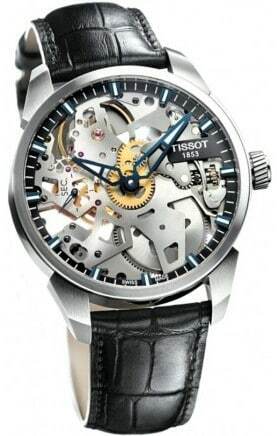 If you are after that impressive look, then this skeletonized Tissot Wristwatch from Tissot will absolutely do the trick. With a fabulous and eye-catching design, you can see through the fascinating watch’s manual mechanical movement. It has a black croc-embossed genuine leather strap with a silver-tone stainless steel deployment-buckle. It features an anti-reflective sapphirine crystal and water-resistant capacity of up to 50meters. This timepiece is more suited for special occasions. If blue is your colour then luck is on your side. 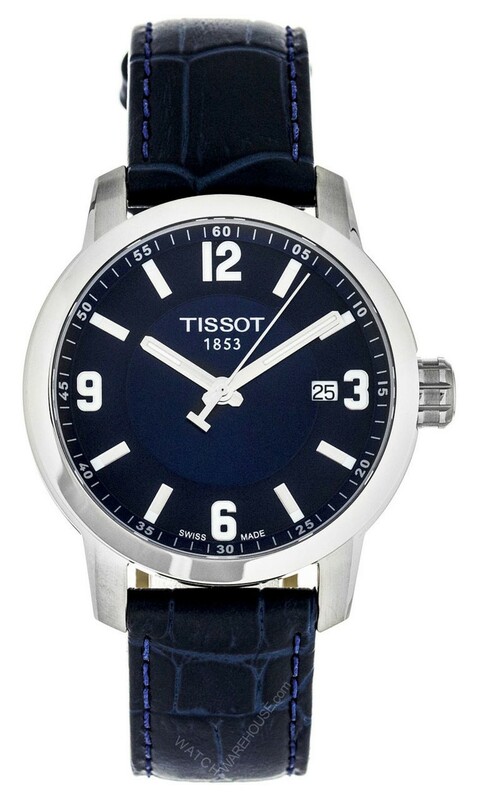 Tissot Men’s PCR 200 Quartz Blue is an attractive watch that features a 39 mm stainless steel case fitted with quartz movement, analogue display type, and a blue dial sapphire display window. It also comes with a blue leather strap. The timepiece also has a date function. This special timepiece encapsulates an important part of Tissot history. 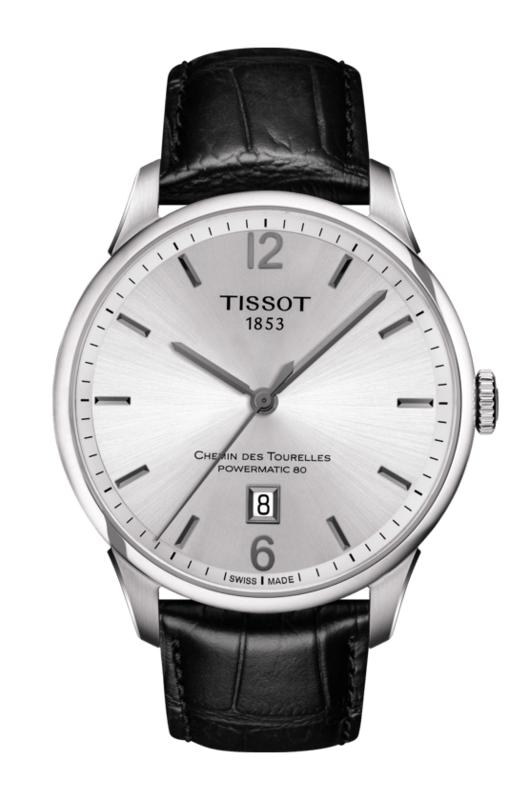 Tissot Chemin Des Tourelles got its name from a street in Le Locle, Switzerland. This is where Tissot factory was first established in 1907 and it is still there till today. The timepiece is embodied with the company’s vast experience and contemporary design. This has resulted in a wonderful watch that has a perfect balance between cost and luxury. It features date display at the 6 o’clock position, scratch resistant sapphire crystal, and Swiss-automatic movement. It also has a case diameter of 42mm with the ability to withstand water up to 165ft. 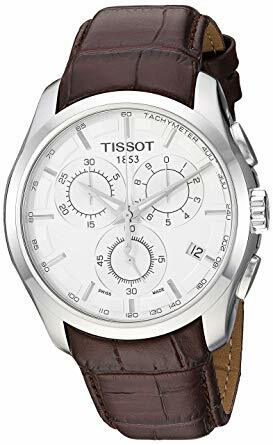 Tissot Quickster Chronograph watch is a Swiss made modern Sports watch. The timepiece is made from stainless steel and it features a chronograph quartz movement. The watch has a nice oversize design of 42mm casing and 10mm thickness. The black leather strap and the white dial offers a perfect combination of colour. The watch also offers you a date function. This watch is suited for young and dynamic minds that are looking for a certain class. Tissot has been making waves since the beginning. By owning a Tissot watch, you are in possession of a timepiece that combines the latest precise technologies and years of tradition. 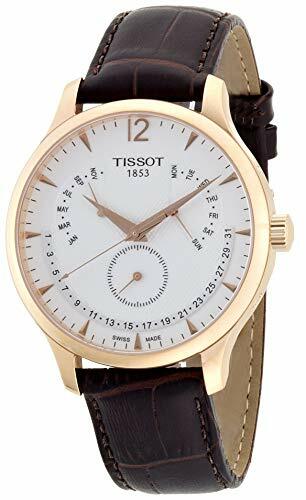 By going through this article, you will be able to make informed decisions on what type of Tissot Men’s watches with leather straps you need.